A picture like this is perfect for today. 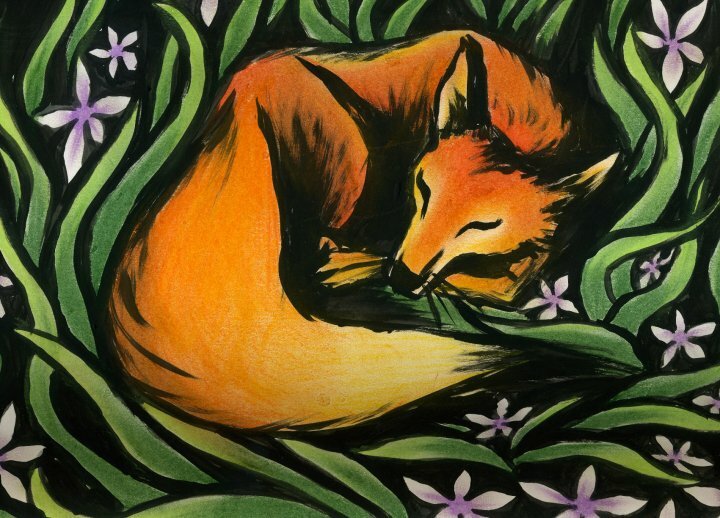 A sleeping fox. That’s what I am. Sitting around, reading a book, shirking pressing responsibilities… I’m a lazy fox. I painted this with black acrylic paint (freehand) and then used bright-colored oil pastels in the blank white spots. I think I may actually be coming down with something. I have been denying it all week, but there’s no other sound explanation for swollen lymph nodes, aching all over, constant congestion, loud sneezing without present allergens, headache, and total lack of motivation. I haven’t had a single clay idea that makes me want to work outside in the hot sun– nothing like when I had the figure sculpture idea, or my flask vases. I have had a few ideas, but no real energy to overcome the heat of the sun. I have felt strange since before the 4th of July, but I’ve been in denial. I guess I should just accept that my immune system is under attack and try to do something about it to combat whatever it is. I got a new book to read today. I had to wait for the library to get it in. It’s Catching Fire, the new book that’s so popular in the Hunger Games trilogy. I didn’t think I would break down and read something that seems to be so mainstream, but it’s popular for good reason. Plus, I’ve got no other real distractions for the weekend. I went to the lake the other day, that was fun. I found out just how out of shape I am for swimming. August 24th is getting ever closer… I can’t help but feel guilty for wishing the summer away, but I haven’t had an enjoyable low-drama summer since I was about 17. Every summer, something happens to ruin it. When I was 18, someone from my class died, and I had to deal with other social dramas. When I was 19, work started getting weird– my boss hired an annoying coworker and made it so I was totally bored, and we had to deal with another coworker who went completely bipolar. When I was 20, I tried a different job that ended up being well-paid slavery (long hours, mental abuse), had a breakdown, quit, went back to my old job, dated a couple of guys that didn’t really spark my interest, and got jipped out of one of my favorite paintings. This year, I kept the same job, had the best cliche summer romance I could imagine, a falling out, and work seems to be even more painfully boring this year than last year– I’ve trained to learn almost all of the lab work, but there isn’t nearly enough to keep me busy, and I end up sweeping the floor and washing dishes out of boredom. It’s shop-keeping work, the kind I can’t stand but I’m desperate just to stay busy for a few more weeks. Plus, it pays okay if I work enough hours. The point is that summers haven’t really been enjoyable since I was in high school. I don’t know what has changed so much to make it that way… maybe it’s me. This entry was posted in Art, Ceramics, Creative Writing, Daydreaming, Deep Thought, Drawing, Fear, Nature, Painting, Philosophy, Sculpture, Uncategorized and tagged anticipation, boredom, counting down, drama, friendship, herbarium sculpture, life, love, rent, summer, summer job, waiting, wasting time, work. Bookmark the permalink.